A nice little phone that looks fresh both on the inside and outside. That's what we took from our first encounter with the Nokia Asha 501 and we do hope we managed to get that point across. You know, with phones that go a dime a dozen, you always risk making it sound like a condescending pat on the head. The Asha 501 is better than that. Yes, it's an entry-level package. A cheap, dual-SIM phone that fits the Asha description to a T. Yet, it's a fresh take on the touchscreen dumbphone concept - in terms of both industrial design and software. It seems Nokia is no longer looking at the Asha lineup as a back-office operation or a way to hedge its bet on Windows Phone with minimum investment. After years of living on the Symbian leftovers, the Ashas are finally getting the respect and treatment they deserve. They have been consistent earners in developing markets but the Asha 501 is, for the first time, likely to make the lineup relevant on a larger scale. Of course, bargain-hunters and first-time buyers continue to be the main target, but a winning combination at last of a fresh, contemporary design and neat and clever interface will certainly raise the Asha 501's prospects. Nostalgic Nokia N9 users buying it for their kid, or people after a sensible - and perfectly capable - backup phone. Why not the kind of users too who value looks over features, or any other group of non-geeks. Though it might help if they're just geeky enough to get the joke in "My other phone is a Lumia 1020". The thing about Ashas is that they'd been trying too hard to offer a near-smartphone experience on the cheap. They always got near but not quite there, and the build and finish were the usual casualty of a tight budget. With the Asha 501, the Finns are on the right track to fixing both issues. 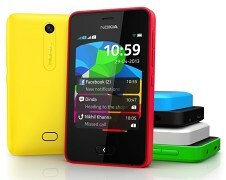 There's nothing revolutionary in the level of equipment: there's optional dual-SIM support and Wi-Fi connectivity, the updated Nokia Xpress browser, a lowly 3MP camera and an FM radio. A capacitive screen is making the right difference (not a first for the series anyway) and there's even a proximity sensor - finally. A fact that speaks to the Ashas' rising standing in the pecking order. A fixed-focus camera and a low-res screen are things most users should be able to live with, considering the phone's price. No fast network data is a thing to consider but if you can't have both 3G and Wi-Fi, the latter is the more sensible choice, particularly in a cheap package like the Asha 501. But it's not all about the features. More importantly, it's a good-looking, compact handset with a battery that lasts. If it sounds like something you might be interested in, you're most welcome to read on. We'll tour the bright-colored exterior and then continue with the clever, swipe-driven interface.